For music lovers in Tampa Bay, the Florida Orchestra has a range of performances coming up in April. Check out the details here! Stuart Malina conducts this morning Coffee Concert that features Bernstein&apos;s Candide Overture, Bizet&apos;s Carmen: Intermezzo, and Rossini&apos;s La gazza ladra Overture (The Thieving Magpie), among other works. There will be a Pre-concert Conversation and complimentary coffee and doughnuts one hour before the concert. This classically-trained dynamo of Cuban musicians, Tiempo Libre, performs a dazzling array of their high-energy “timba” style music. They mix jazz, salsa, son, conga, cha-cha-chá and even Bach. It will be a night of hits from their Grammy-nominated CDs Bach in Havana, Lo Que Esperabas and Arroz Con Mango, along with music from their latest CD My Secret Radio. Guest Conductor is Sarah Hicks. From contemplative to frenzied, it is a night of folk dance-inspired favorites from Brahms’ Hungarian Dances, Dvorák’s Slavonic Dances, Bartok’s Dance Suite and Kodály’s Dances of Galanta. It will also feature John Adams’ The Chairman Dances and Bernstein’s Three Dance Episodes from On The Town. Guest Conductor is Perry So. There will be a Pre-concert Conversation one hour prior to curtain. Post-concert Conversation will immediately follow the morning performance on April 12. In an all-Mozart concert, the evening opens with Ave Verum Corpus and Symphony No. 35, Haffner. Featuring The Master Chorale of Tampa Bay with guest conductor Xian Zhang, the concert will continue with Mozart’s sublime and inspiring Requiem with one wave of beauty cascading after another, providing the listener with a breathless yet exhilarating experience. There will be a Pre-concert Conversation one hour prior to curtain. Tickets are on sale at 800-662-7286 and online at www.floridaorchestra.org. 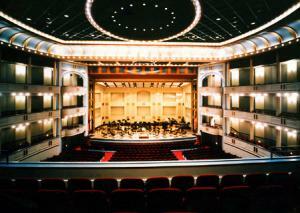 Become a fan of The Florida Orchestra on Facebook or follow them on Twitter.